California is the best state in the US for those people who consider comfortable temperature and weather. Also there are lots of exceptional houses that truly speaks of elegance and luxurious lifestyle of the homeowners. Now we will share to you a house named Vernon Residence which is specifically located in Los Angeles, California. 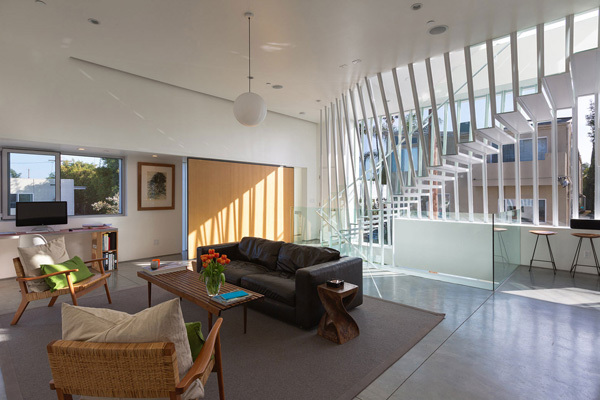 This residential house is actually a new home for two related families. Although this is just a single building with two structures that are placed back-to-back, it allowed a private garden entrance as well as the communal roof deck here. 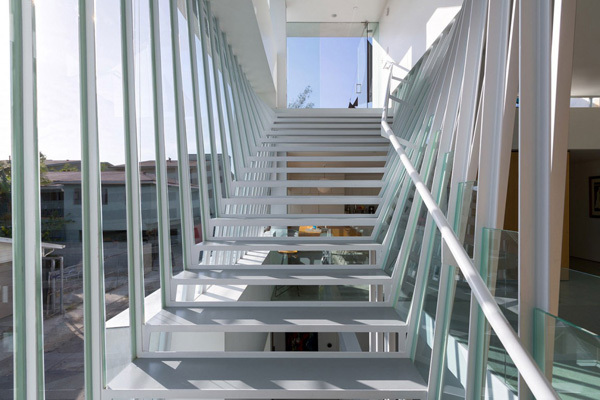 It has a two storey-building that highlighted the shifts to the long alley, and also stressing the unique stairs, views as well as the available light intended for the main living façade. Now let us explore more of the wonderful areas designed both in the interiors and exteriors of the house through the images below. 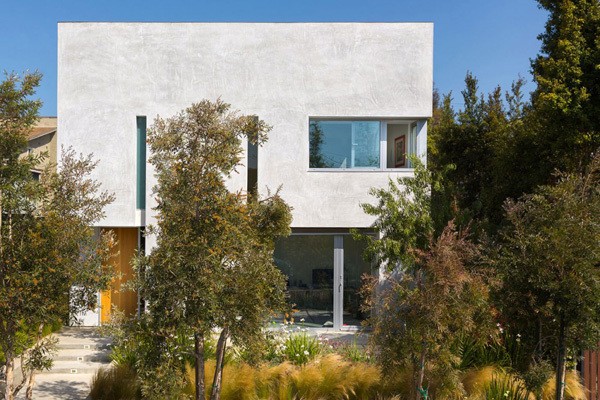 Geometric forms of the house is highly displayed in the heart of the tall trees and landscape. 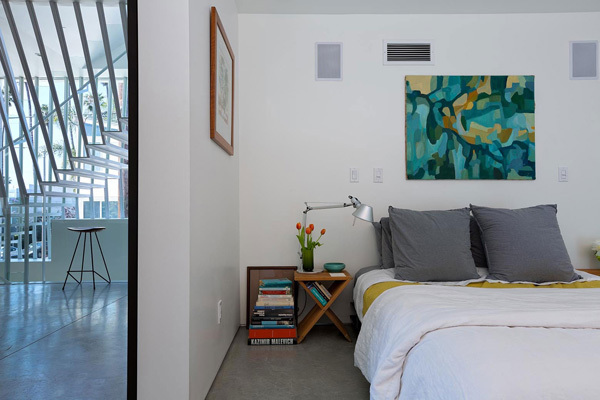 We can carefully observe how the grey stoned floors complements with the white walls and ceilings. 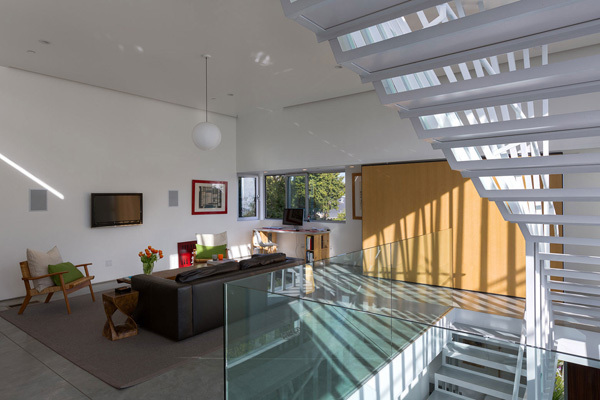 At the second level of the house is the living space where natural light is also accessible. 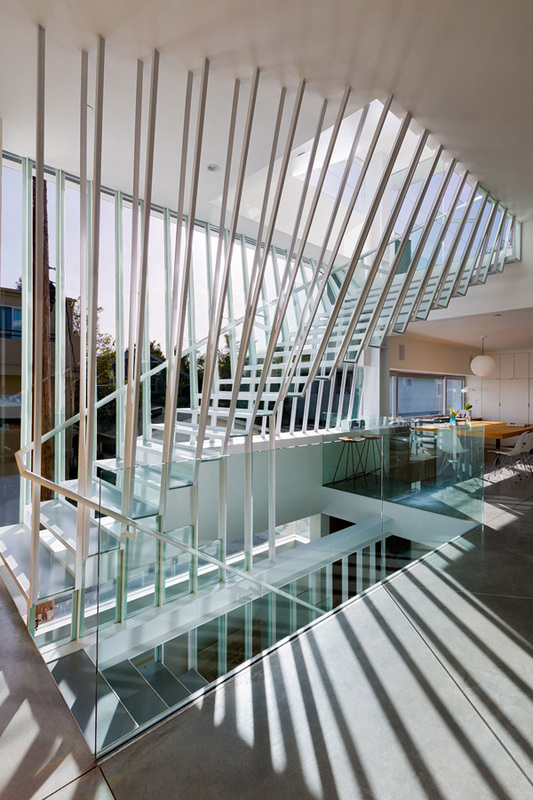 See the glass frame in the staircase area that allows the concept of transparency as this makes the area spacious, too. Take a look at the round lamp set in the center of this sofa that adds elegance and simplicity. 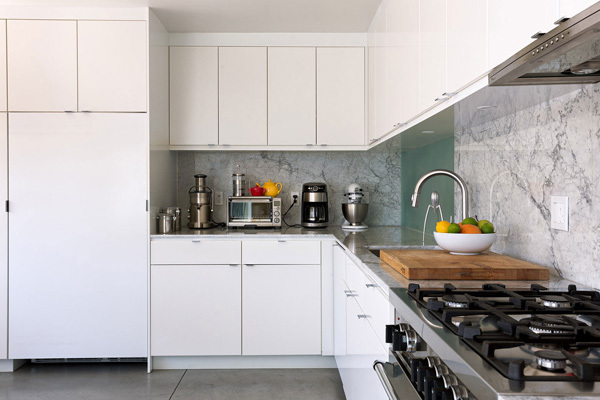 Simple and trendy style of appliances is well-arranged in this neat kitchen. 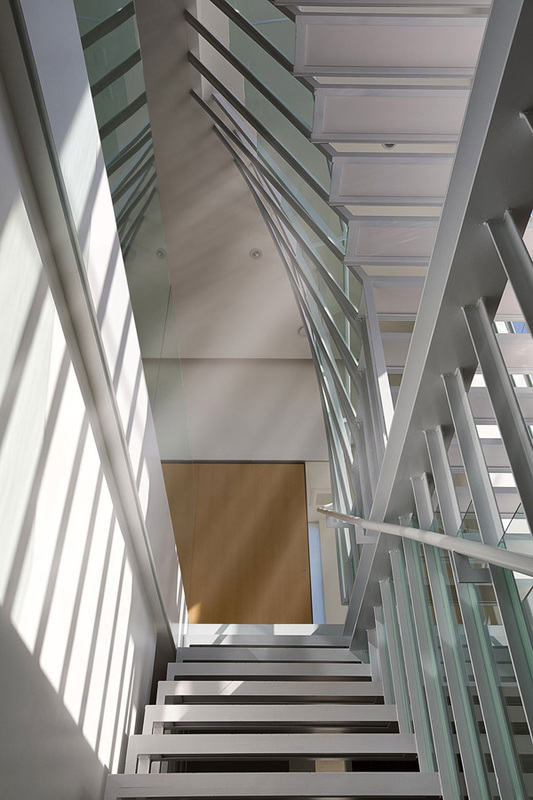 See the lines and patterns in the staircase and its frames that speak of art and modern concept. See the movements of the lines that is impressive and expressive for the designer’s artistic and trendy ideas. Even the ceiling uncovers the lines and patterns that made this area unique. 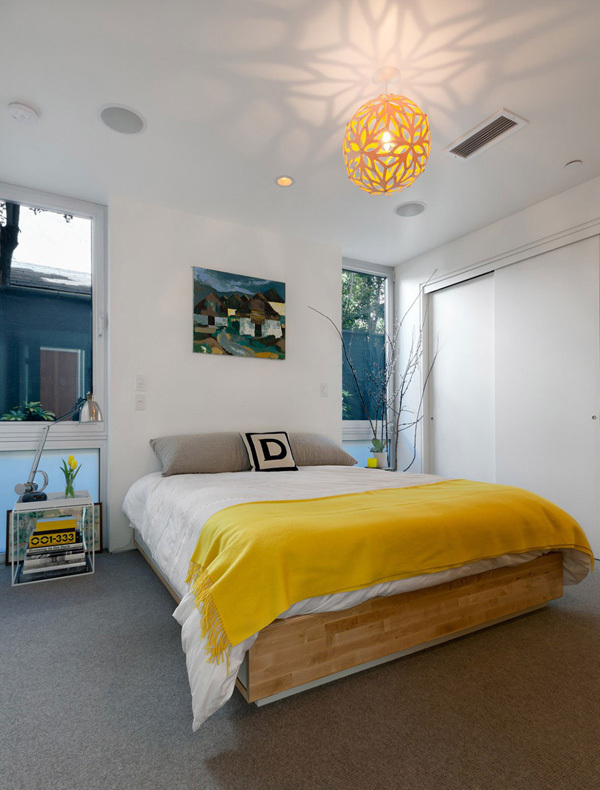 The exceptional and modern design of the lamp blended well with the golden yellow mattress in this bed. Another bedroom in the house that also reveals its simple yet modern theme and design. 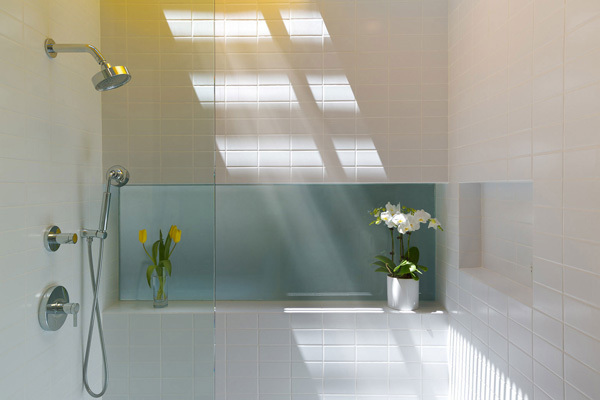 Here’s the golden yellow flower that stand out in this white and hygienic bathroom. 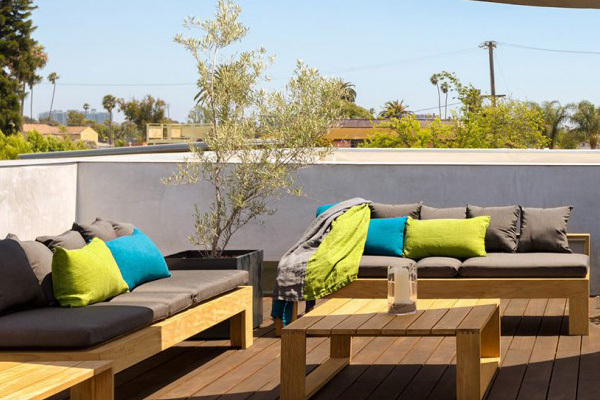 Natural light is well experienced in this spacious and elegant roof deck. Looking closely at the trendy and sophisticated color of these wooden chairs with the candle in the center table. In the late afternoon, the vivid lights in interior as well as in the exterior stressed the geometric figure and extraordinary design of the house building. 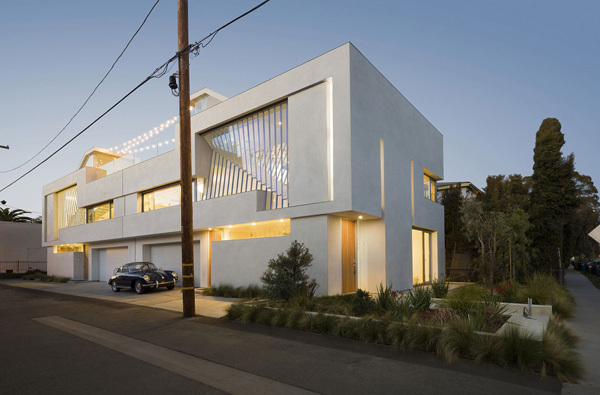 Vernon Residence truly unveils the modern concept of the house design. For the homeowner also achieved the comfort from its details in the interior down to the private garden. 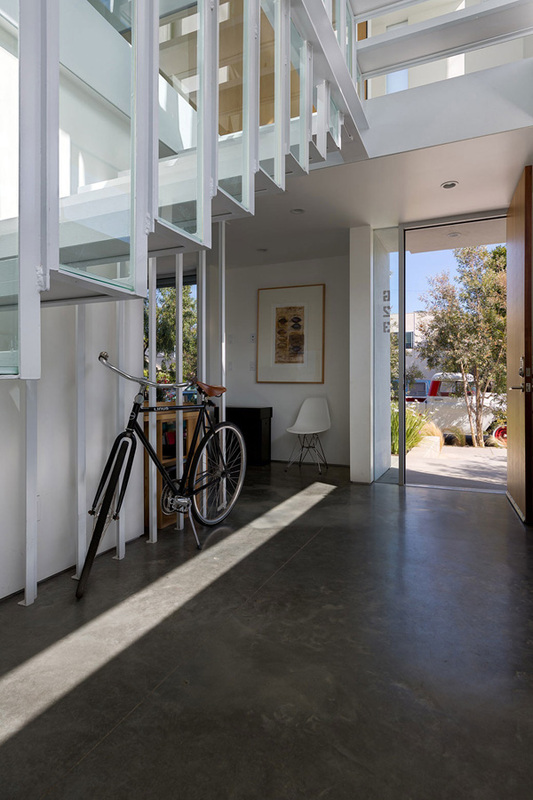 Completed in 2012, the Dimster Architecture skillfully and carefully planned the design and concept of the house. Their concept is based on the future needs of the families, too. I personally like the designs of the bedrooms which can also convert into office or den space. Modern and innovative details were also implemented here such as the garage accessibility for internet access like for office expansion. We know that you were amazed and inspired with the unique and innovative ideas utilized by the designers to make this house more modern and functional as well. The ideas and functions of this house can also be applied in your own houses, too.